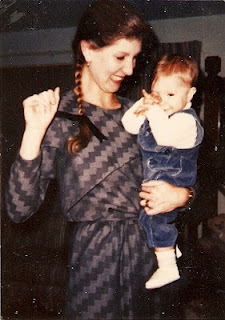 I'm sure lots of people feel this way, but I am pretty sure I have the best mom in the world. I didn't realize how great until I got older and could understand the sacrifices that she's made for me and my siblings. Although we don't always get along or see eye to eye (and we have definitely had our rough spots), she has always been there for me. She is super supportive and non-judgmental. She's always been the "cool mom" and most of my friends have a bond with her. She supports me emotionally, mentally, and financially. I've called her late at night for rides and once at 3am to use her bathroom (long story). She runs errands with me and we have fun together. We love to get coffee and chat. Growing up, I don't think I could have had a better mother. So mom, thank you for all you've done for me. And here is a wonderful picture with my mom, Nana, and Gramie. 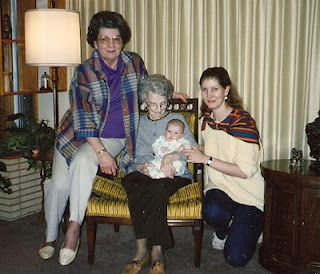 Four Generations of women! Awww, so cute! Heart you, Mommy!